These classic long-distance hikes wind through scenic wilderness areas that offer spectacular settings for earning the BSA’s 50-Miler Award. Weekend hikes are great opportunities to teach Scouts hiking skills and a love of the outdoors. But for older, experienced Scouts and Venturers, a long-distance backpacking trek, like a classic 50-miler, puts it all together. Here’s a chance for Scouts to experience the essence of hiking: to slow down and live at nature’s pace, to experience how a landscape changes as one moves over miles and miles of terrain, to cope with unexpected weather, and to bond with others in the group. And completing the trek brings a well-earned sense of achievement, certified by qualifying for the BSA 50-Miler Award (shown above). In addition to helping your Scouts plan and prepare for a successful trek — from planning age- and skill-appropriate activities, budgeting, preparation, equipment, safety and key principles of Leave No Trace — you’ll also need to choose a location for your hike. Check out the five suggestions below. Don’t see your favorite location on this list? Share it in the comments section. This famous traverse above tree line takes in the Presidential Range, including Mount Washington, at 6,288 feet, the highest peak in the Northeast. On a clear day, the 100-mile views are spectacular. This 53-miler begins at the trailhead of the Appalachian Trail near Franconia Notch and starts with a steady climb north following the AT’s trademark white blazes to Mount Lafayette. If you’re staying in huts (read more about these below), you’ll want to descend off the AT to Greenleaf Hut for the night, then regain the elevation back to the ridge in the morning. The trail continues along rocky Garfield Ridge down to Galehead Hut and past Zealand Falls Hut, climbs to Mizpah Spring Hut, then traverses to Lakes of the Clouds Hut, climbs over the summit of Mount Washington, and follows the above-tree line tundra of the Presidential Range’s high peaks to Madison Hut. The hike ends with a tricky, rocky descent to Pinkham Notch. This is a trip for fit, experienced groups only. The terrain is rocky and difficult — so when planning your hike, don’t count on doing more than two-thirds of your group’s average daily mileage. Warning: Three weather fronts intersect here, and storms can be unpredictable and violent. In fact, trail signs near the tree line warn hikers that they are entering an area that has some of the worst weather in the world. Need proof? The highest wind speed ever recorded—an astonishing 231 miles per hour—was recorded atop Mount Washington, and although that reading was taken more than 70 years ago, the peak boasts hurricane-speed winds more than 100 days of the year. You’ll need good rain gear and extra layers of warm clothes, even in August. The Appalachian Mountain Club operates a hut system, which welcomes groups. You’ll need to make reservations well in advance, but if you do, you can leave behind tents, air mattresses, cooking equipment, and most of your food. (Breakfasts and dinners are provided.) For do-it-yourselfers, tent campsites are available; note that you must camp in designated sites. Contacts: Appalachian Mountain Club, (603) 466-2727, www.outdoors.org; Appalachian Trail Conference, (304) 535-6331, www.atconf.org. Wyoming’s Wind River Range is not quite as famous as its high-profile neighbors, Grand Teton and Yellowstone national parks, but hikers in the know flock to this high-country wonderland for good reason. Sky-spearing pinnacles like Gannett Peak (Wyoming’s highest summit) and the famous Cirque of the Towers frame hundreds of lakes and tarns. Miles of interlocking trails make this a backpacking paradise. And the terrain is remarkably gentle for such high ground, which means easier mileage and more energy at the end of the day for exploring side trails and fishing in the lakes and streams. This hike just qualifies as a 50-miler — but you can easily add more mileage with side trips and loops or a visit to the Cirque of the Towers. From the Big Sandy Trailhead at the end of Forest Road 299, take Trail 96 to North Fork Lake, then head west on Trails No. 115 and No. 94 to Pole Creek Lakes. Continue west on Trail No. 119 to the Trail’s End Campground at the end of Road 134 near Pinedale. Much of this hike is just below the Continental Divide. The average elevation is above 10,000 feet, which means that it’s largely above tree line and has glorious views. Seasons: July through September; best in August. Contacts: Bridger-Teton National Forest at (307) 367-4326; www.fs.fed.us/btnf/. The Three Sisters are unique because they are the only large volcanoes clustered in the Cascades. The rest of the range’s famous peaks — for example, Mounts Hood, Rainier, Adams and Shasta — rise alone over surrounding smaller hills. But the Sisters, along with the lesser peaks in their orbit — Bachelor Butte, The Husband, The Wife and Little Brother — are a tight-knit family big on beauty and drama. The terrain underfoot is equally stunning. Gray-brown lava fields stretch for miles, a stark, sere landscape where the only sign of life is the occasional struggling, scraggly tree. Lava ridges, cinder cones, pumice fields and obsidian outcrops give plenty of evidence that this is a landscape forged by fire, while lakes and ponds attest to the sculpting force of glaciers. For a 53-miler that takes in the highlights of the area, start at Forest Road 600 near Irish Lake and the popular Irish Lake Campground. Head north on the well-marked Pacific Crest Trail. For the first couple of days, the path is largely in forest, but dozens of lakes and tarns offer prime campsites, fishing, and swimming. As you approach the Sisters themselves, the forest opens and the views are overwhelming, especially from Sisters Mirror Lake. You’ll pass all three of the big volcanoes as well as features like the Wickiup Plain and Le Conte Crater. This section ends at McKenzie Pass on Highway 242. Seasons: July through September; July is buggy; August is best. Contact: Deschutes National Forest (541) 383-5300; www.fs.fed.us/r6/centraloregon. The Pacific Crest Trail Association, www.pcta.org/about_trail/overview/oregon.asp. Those who have hiked the Ozark Highlands Trail through the remote forested hills of Arkansas rate it among America’s top long trails. Nonetheless, the 165-mile-long OHT remains something of a secret. With dozens of access points, trailheads, and highway crossings, the OHT offers several possible 50-mile hikes. This one, from Ozone Campground to Ben Hur Trailhead, features numerous waterfalls and swimming holes, and a traverse of one of the trail’s highlights, the Hurricane Creek Wilderness. This OHT is a year-round trail. In spring, wildflowers like serviceberries, redbuds, dogwoods, wild plums, and wild orchids fill the forests. In summer, dozens of waterfalls, creeks, and emerald pools offer respite and refreshment. Fall’s awesome foliage rivals New England’s more famous displays, complete with maples, oaks, and hickories, and a brilliant underbrush of sassafras and sumac. And don’t forget winter: December, January, and February are generally mild and snow-free, with good views through the bare trees, not to mention a welcome absence of bugs and snakes. 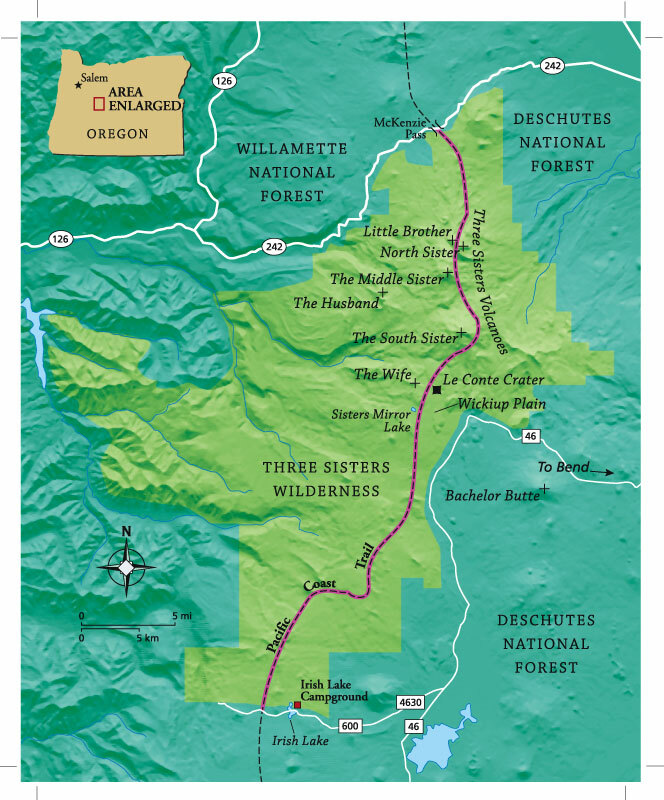 This hike begins at Ozone Campground, at Highway 21 (a national scenic byway). Going west to east (as the guidebook is written), it passes a Civilian Conservation Corps (CCC) camp and the Little Piney Creek, then a series of rock formations, creeks, gorges, and swimming holes. En route is the Big Piney Creek, a whitewater rafting destination; you can make plans in advance with local outfitters to take a day off for a float trip. 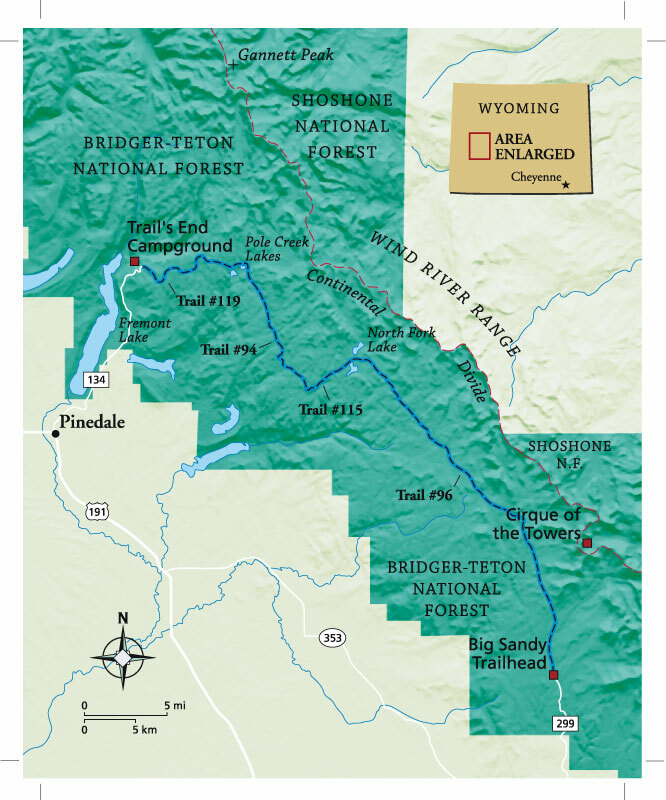 The trail then runs smack through the middle of the Hurricane Creek Wilderness, then crosses Highway 7 (another scenic byway). This 50-mile section ends at Ben Hur Trailhead at Forest Road 1203. Contact: Ozark Highlands Trail Association. The man who came up with the modern idea that wilderness is something to be protected — 20th-century environmentalist, forest ranger and writer Aldo Leopold — did so in the remote, dry mountains and cliff-lined rivers of New Mexico’s Gila National Forest. This 50-mile hike starts on Highway 15 near Silver City, about a quarter-mile west of the junction of Highways 15 and 35, and descends on Trail No. 247 to the junction of Sapillo Creek with the winding, twisting Gila River. Head upstream on Trail No. 724, following the river as it snakes its way though the canyon. Rafting sandals are a good idea; on this hike the trail crosses the usually knee-deep river more than 100 times. About a mile before the trail recrosses Highway 15, take a break and soak in the backcountry Gila Hot Springs. When the trail joins Highway 15, you’ll have a three-mile walk on the road (4 and a half miles if you take a recommended side trip to the Gila Cliff Dwellings National Monument). From here, you’ll backtrack to the West Fork of the Gila River, then follow Trail No. 151 upstream to just north of McKenna Park; follow Trail No. 152 to Mogollon Baldy Peak (10,770 feet), and Trail No. 182 over Whitewater Baldy (10,895 feet). The hike ends on Forest Road 159 near the settlement of Mogollon. Seasons: April through mid-October, but call for current snow and river level conditions. Contact: Gila Cliff Dwellings National Monument Visitor Center, (505) 536-9461; www.fs.fed.us/r3/gila/wild. read more about the details of earning the 50-miler award. This is excellent. What a great way to help our young men earn such an honor. Way to go! Keep up the great work! I can’t wait to share this with my Troop. Yours In Scouting, Linda Ann Horvath, Assistant Scoutmaster, Troop 300, Saint Veronica’s Church, Howell, NJ. Are there any places to do this in Georgia or Alabama? Skilled backpackers have done the full route in 8 days, but 14 seems better for Scouts. Buffalo Trail Scout Reservation in west Texas offers a 60 mile high adventure mountain hike. My son (and husband) are hiking it this summer. Buffalo Trails Scout RANCH (not reservation)!! How about the continental divide in Colorado. Our Troop 262 Gonzales, will be hiking 75 miles of it this June. Pictured Rocks National Lakeshore in Michigan is 40+miles so throw in a couple side hikes and it is a great place to get a 50miler patch.